The unified command structure is flexible, and changes as required to accomodate evolving U.S. national security needs. 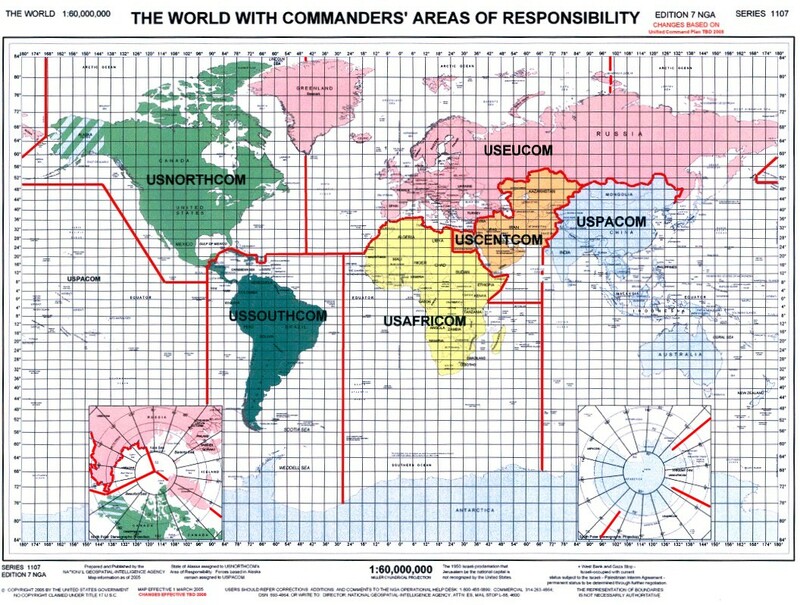 A classified document called the Unified Command Plan (UCP) establishes the combatant commands, identifies geographic areas of respon sibility, assigns primary tasks, defines authority of the commanders, establishes command relationships, and gives guidance on the exercise of combatant command. It is approved by the President, published by the CJCS, and addressed to the commanders of co mbatant commands. The Unified Command Plan (UCP) is the document that sets forth basic guidance to all combatant commanders. The UCP establishes combatant command missions, responsibilities, and force structure; delineates geographic areas of responsibility for geographic combatant commanders; and specifies functional responsibilities for functional combatant commanders. The unified command structure generated by the UCP is flexible, and changes as required to accommodate evolving U.S. national security needs. Title 10 USC 161 tasks CJCS to conduct a review of the UCP "not less often than every two years" and submit recommended changes to the President, through the Secretary of Defense. Five combatant commanders have geographic area responsibilities. These combatant commanders are each assigned an area of responsibility (AOR) by the Unified Command Plan (UCP) and are responsible for all operations within their designated areas: U.S. Joint Forces Command, U.S. Central Command, U.S. European Command, U.S. Pacific Command, and U.S. Southern Command. 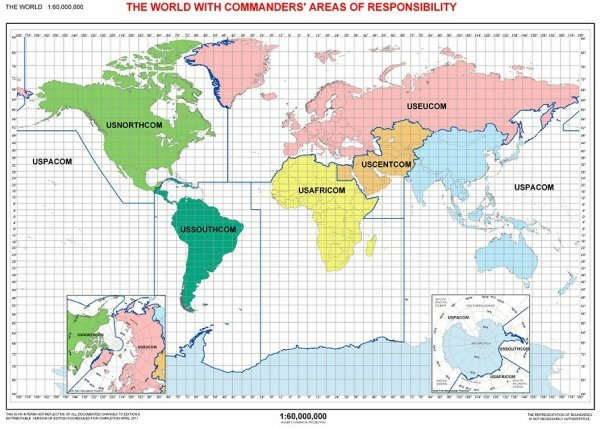 There are four combatant commanders assigned worldwide functional re-sponsibilities not bounded by geography: U.S. Space Command, U.S. Special Operations Command, U.S. Strategic Command, and U.S. Transportation Command. Unified and specified combatant commands were first described in the NSA of 1947 and the statutory definition of the combatant commands has not changed since then. A Unified Combatant Command is a military command which has a broad, continuing mission under a single commander and which is composed of forces from two or more military departments. A Specified Combatant Command is a military command which has a broad, continuing mission and which is normally composed of forces from one military department. There are currently no specified commands but the option to create such a command still exists. The term combatant command means a unified or specified command. The commander of a combatant command is designated commander in chief (CINC). An objective of the Goldwater-Nichols Act of 1986 was to clarify the command line to the combatant commanders and to preserve civilian control of the military. The act stated that the operational chain of command runs from the President to the Secretary of Defense to the combatant commanders. The act also stated that the President "may direct" that communications between the President or the Secretary of Defense and combatant commanders be transmitted through CJCS. In the Unified Command Plan, the President executed this option and directed that communications between the NCA and the combatant commander will be transmitted through CJCS. Further, by statute, the Secretary of Defense is permitted wide latitude to assign oversight responsibilities to CJCS in the Secretary's control and coordination of the combatant commanders. This authority has been exercised in DOD Directive 5100.1 and other directives. The commanders of combatant commands exercise combatant command (command authority) (COCOM) of assigned forces and are directly responsible to the NCA for the performance of assigned missions and the preparedness of their commands. Combatant commanders prescribe the chain of command within their commands and designate the appropriate level of command authority to be exercised by subordinate commanders. The military departments operate under the authority, direction, and control of the Secretary of Defense. This branch of the chain includes all military forces within the respective Services not specifically assigned to commanders of combatant commands. Some have suggested that DoD can no longer afford simply to wait and react to the next crisis in Africa. A regional command separate from the U.S. European Command or the U.S. Central Command could be established to evaluate, plan and execute regional military exercises and operations. A more specific regional focus would enhance DoD coordination and cooperation with the country teams, USAID, NGOs, and PVOs, as well as African organizations such as the Organization of African Unity. Creates a new combatant command, U.S. Northern Command, and assigns it the mission of defending the United States and supporting the full range of military assistance to civil authorities. Shifts U.S. Joint Forces Command's geographic area of responsibility to the U.S. Northern Command and U.S. European Command. This enables U.S. Joint Forces Command to focus on transforming U.S. military forces. Effective Oct. 1, 2002, the plan also designates geographic areas of responsibilities for all combatant commanders and assigns them responsibility for security cooperation and military coordination with all countries in the region. The continental United States, Canada, Mexico, and portions of the Caribbean region will be designated as U.S. Northern Command's area of responsibility. While Alaska will be included in this assignment, Alaskan Command forces will remain assigned to U.S. Pacific Command. The commander U.S. Northern Command will also be responsible for security cooperation and military coordination with Canada and Mexico. Russia and the Caspian Sea will be included in the area of responsibility assigned to U.S. European Command, however U.S. Pacific Command will retain responsibilities for certain activities in Eastern Russia. Antarctica will be included in the area of responsibility assigned to U.S. Pacific Command. On February 6, 2007, President Bush and Defense Secretary Robert Gates announced the creation of U.S. Africa Command. 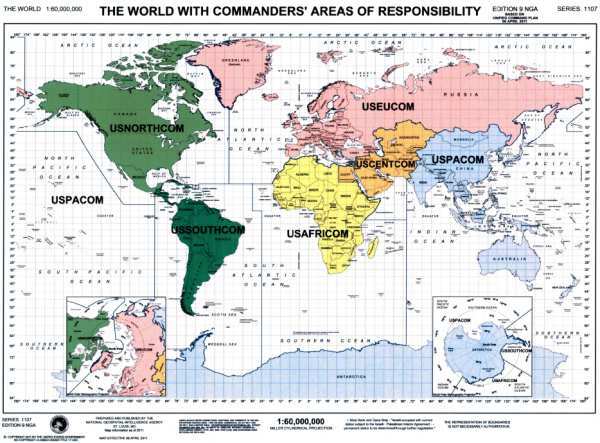 AFRICOM has responsibility for the entire continent of Africa, except Egypt, and the surrounding islands. 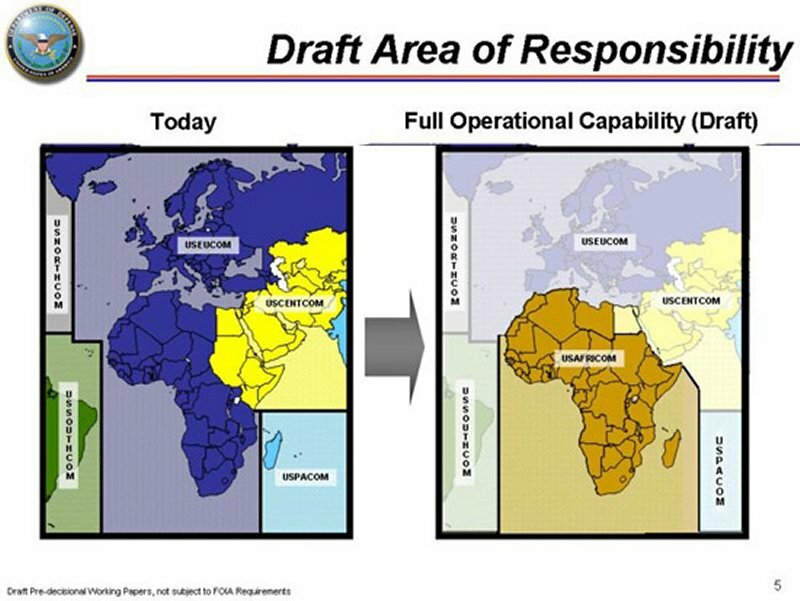 AFRICOM assumed responsibility for Ethiopia, Eritrea, Kenya, Somalia, and Sudan, all of which had been in CENTCOM's AOR. On December 23, 2007, DoD updated the Unified Command Plan (UCP). UCP 2008, signed by President Bush on Dec. 17, codifies U.S. Africa Command (USAFRICOM) and assigns several new missions to the combatant commanders. - Expanding U.S. Strategic Command’s responsibility for combating weapons of mass destruction and developing Global Missile Defense Concept of Operations. On September 14, 2011, DoD issued a change to the Unified Command Plan (UCP). The change, signed by President Obama on September 12, 2011, captured administrative changes required to reflect the disestablishment of U.S. Joint Forces Command in addition to other secretary of defense-directed efficiencies initiatives. Removing language that refers to U.S. Joint Forces Command (USJFCOM), which was disestablished on Aug. 31, 2011. Removing language for geographic combatant command standing joint force headquarters, which are approved for disestablishment by the end of fiscal 2012. Adding responsibility for global standing joint force headquarters to U.S. Transportation Command. These assets will transfer as the Joint Enabling Capabilities Command from USJFCOM. Transferring the Joint Warfare Analysis Center missions to U.S. Strategic Command (USSTRATCOM). Joint Warfare Analysis Center was previously a subordinate command to USJFCOM. Removing language and responsibilities for information operations, military deception, and operations security from USSTRATCOM. These missions will transfer to the Joint Staff.